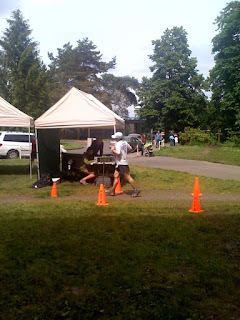 I ran my first Trail Ultra on Sunday at the PCTR Forest Park Trail 50k, in Portland Oregon. This was even closer to virgin territory than the word “first” might suggest as it was only my second trail race ever and only my second Ultra race ever. That being said, I felt like I was in very good shape going in and thought my biggest challenge would be holding myself back as I really wanted to continue my Eugene Marathon (slower and more consistent pacing) approach. I grossly underestimated many things. 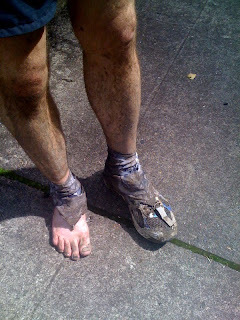 The mud, the hills, the mud, the terrain, the mud and the mud. It became obvious pretty quick, that I was in for a fight. And, the winner, by unanimous decision......Forest Park. It didn't knock me out!!! It did however, knock me down a few times though. The whole experience was pretty humbling. I learned that I'm kind of priss. head. All the way up to the aid station I was gonna quit. Then, Jeanne asked me what I needed, I took a quarter of a P n J sandwich and a new bottle and took off. I can't count how many little turns of the ankle I experienced. I do know the left one rolled all the way over 3 times and the right one once. I fell three times, the only positive being, I never was going that fast so they were more of a stumble than a fall. Never in my wildest nightmare could you have convinced me that a 50k could take me 6 and a half hours. I remember not too far past 20k, recalculating my original goal time and thinking 6 hours was possible. At 30k, I jokingly said, "maybe I'll break 6:30". Whew, 6:28, barely! I survived, that's really what I take away. I really admire the people that are good at this kind of running. I know it's part training, part technique and part guts. At one point I thought of a line from the movie Rumble Fish, "Blind terror, in the face of a fight, can easily pass for courage". May 2010 ended up at 240 miles, and somewhere through the middle of the month I went past 12,000 miles total. Now the big miles begin. As I type this on June 2nd, I have 87 days 'til the Lean Horse Hundred. Still, a few adventures to go between now and then.